Three of us stand atop a grassy, sand-dune bluff that rises along the western flanks of Anchorage, Alaska, our attention focused on the gray waters of Cook Inlet. Only a slight breeze moves across the land and adjacent seascape, which makes us doubly happy. First, because it’s October and the air temperature hovers just above freezing, and second, because the inlet is only slightly rippled, making our job so much easier. We’ve come here to look for belugas, also known as “white whales” because adults are distinctively white to whitish-gray. None of us is a beluga expert, but each is interested enough in the whales—and their well-being—that we’re charter members of a citizen-science effort called the Anchorage Coastal Beluga Survey. The effort is the brainchild of Barbara Carlson, a long-time resident and driving force behind Friends of the Anchorage Coastal Wildlife Refuge (FAR). The state-managed refuge, consisting of tidal flats, marshes and boggy forest, stretches 16 miles along the city’s coastline and is seasonally inhabited by more than 120 species of birds plus assorted fish and mammals, including the belugas that sometimes pass through refuge waters at high tide (and whose bodies occasionally wash up on shore). What do belugas eat? Find out this and more from our fact sheet. Carlson’s concerns about the belugas’ health inspired the citizen-survey program, with the goal of gathering data on the distribution and behavior of belugas along Anchorage’s coast. By the fall of 2008, she was ready to launch the volunteer effort, with help from several partners: Defenders of Wildlife, independent researcher Tamara McGuire and the National Marine Fisheries Service (NMFS), part of the National Oceanic and Atmospheric Administration (NOAA). Some two dozen people responded to the call. After a start-up orientation, volunteers were divided among three sites considered ideal for spotting belugas, including the bluff where I’ve joined team leader Erika McDonald and volunteer Pixie Siebe. Our crew is one of the first to look for the smallish, northern white whales as they move through Upper Cook Inlet. We’re also one of the first to record a sighting. Five minutes into our two-hour shift, McDonald looks up from her data sheets and shouts, “I think I might see a whale.” Aiming my binoculars in the direction she is pointing, I quickly confirm the sighting: “Yep, no question it’s a beluga.” Not only is the whale white, it lacks a dorsal fin. And a brief glimpse of its mostly submerged head reveals a characteristically bulbous shape. 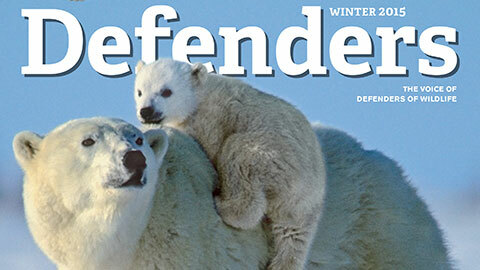 Find out how Defenders is helping beluga whales. With Siebe on the team’s spotting scope and me squinting through binoculars, we begin to count individuals, note the presence of calves and determine the whales’ color—calves and some adults are gray, not white—which is not an easy task with the sun gleaming on the water. For the next hour, we watch the whales as they move steadily along the coast and out of sight. In the end, we all excitedly agree we saw at least 13 individuals, including two calves. Like most locals, we’ve seen belugas as they swim along the city’s shores or through nearby Turnagain Arm. But to study them as part of an organized program that’s intended to help federal managers is a special treat. And the timing of this citizen-science effort couldn’t be better. After years of studies and controversy, the federal government officially declared Cook Inlet’s beluga whale population endangered in 2008. Though many thousands of belugas inhabit Alaska’s coastal waters, Cook Inlet’s are considered isolated and genetically distinct. A 1979 aerial survey estimated the inlet beluga population at 1,300, while anecdotal accounts suggest a few thousand may have resided here less than a century ago. But when NMFS began actively monitoring the whales in the mid-1990s, researchers found their numbers had dropped by half the 1979 count. And by 1998, the official estimate had fallen to 347 animals. Help save belugas and other whales by adopting a whale at our Wildlife Adoption Center. Overharvesting by subsistence whalers was initially blamed for the decline in the mid-1990s. But numbers continued dropping even after the hunt ended, suggesting other unknown factors to be at play. The 2008 count put the inlet’s population at about 375 whales, suggesting a slight rebound. But the 2009 estimate of 321 belugas gave further evidence of a declining population. Federal managers and a broad array of conservation groups, including FAR and Defenders of Wildlife, believe this unique population remains at risk of extinction, unless special measures are taken to protect it. One such measure happened last December, when NOAA proposed to designate 3,000 square miles of Cook Inlet as critical habitat. But even with that added layer of protection, researchers, managers and conservationists agree that much more needs to be learned about the whales’ seasonal habits and distribution. And that’s where the citizen survey comes into play. Jaguars may finally get the protection they deserve in the American Southwest now that the U.S. Fish and Wildlife Service (FWS) has agreed to create a recovery plan for the imperiled felines. Its name may sound silly, but the bobolink is a serious songster—and a world-class traveler. These dark birds sail the night skies, migrating to grasslands, hayfields and meadows in North and South America—a round trip that’s about 12,500 miles long. Dwelling high in western mountains, American pikas bear little resemblance to their closest cousin—the rabbit.